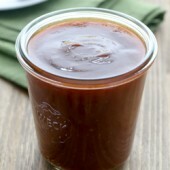 Sweet and spicy apple cider barbecue sauce. A perfect addition to chicken, pork, pizza and so much more! In a small saucepan, whisk together apple cider and flour. Whisk in remaining ingredients. Cook over medium heat, whisking frequently until mixture thickens. Remove from heat. Transfer to a clean jar or storage container. Use immediately or chill until ready to use. Recipe yields roughly 3/4 cup.